H N Thatoi | I.K International Publishing House Pvt. 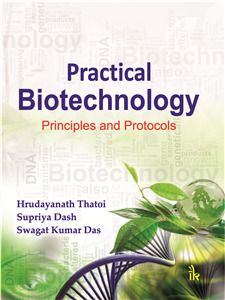 Ltd.
is presently working as Professor and Head, Department of Biotechnology, North Orissa University, Baripada, Odisha. He has also served as Reader and Head of Department of Biotechnology, College of Engineering and Technology, a constituent college of Biju Patnaik University of Technology, Rourkela, Odisha and Assistant Professor (Microbiology), Basic Science College, OUAT, Bhubaneswar. Dr. Thatoi completed his P.G., M.Phil and Ph.D from Utkal University, Odisha. Dr. Thatoi has 12 years of teaching and 20 years of research experience in the field of microbiology and biotechnology. His areas of teaching and research include microbial diversity, molecular biology, genetic engineering, environmental and industrial biotechnology. He has implemented many research projects funded by DST, Government of Odisha, UGC-DAE, Government of India and State Forest Department, Government of Odisha.